In 1893 two cousins from Alsace, Théophile Bader and Alphonse Kahn, opened a small shop on the corner of rue La Fayette and the Chaussée d’Antin. 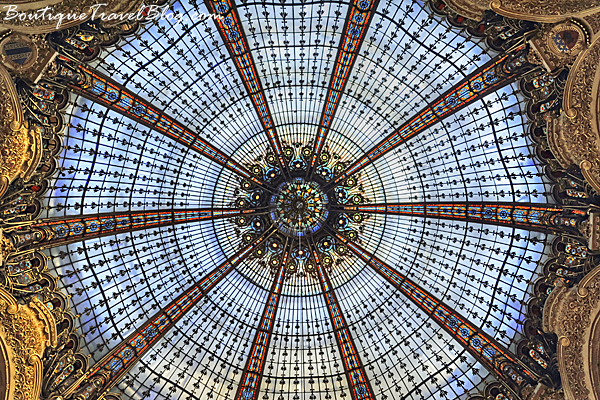 Over the years they expanded into a number of buildings in the area and in 1912 the famous steel and glass dome in the boulevard Haussmann store, was finished in what is now the most prestigious department store in Paris. Designed by Ferdinand Chanut and built by master glassmaker Jacques Gruber, the dome is as spectacular today as they were then and are visited and photographed by thousands each year. It is well worth visiting the store just to see the dome. Be sure to also check out Galeries Lafayette’s and its neighbouring department store Printemps’ roof-top terraces. Both provide unimpeded 360 degree views over Paris. 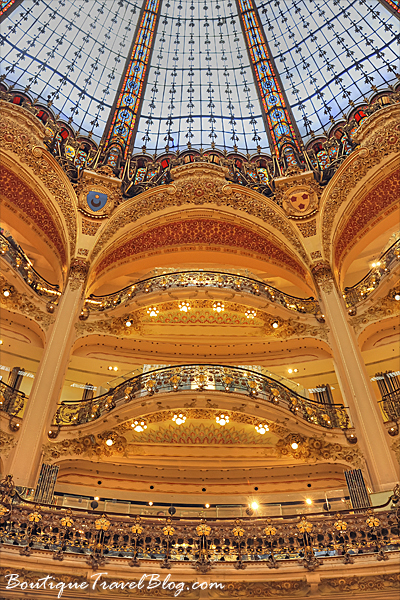 Galeries Lafayette, on Boulevard Haussmann, has three main buildings. The first, Lafayette Coupole, contains the designer collections, children’s fashion, cosmetics, jewelry and accessories, books, music, electronics and the Lafayette Marriage Boutique. A restaurant, the roof-top terrace and glass dome are also in this building. Connected to this by a covered walkway is Lafayette Homme with men’s fashion and accessories, as well as an excellent gourmet food shop, Lafayette Gourmet. Across the street in Lafayette Maison you’ll find the latest in home furnishings. 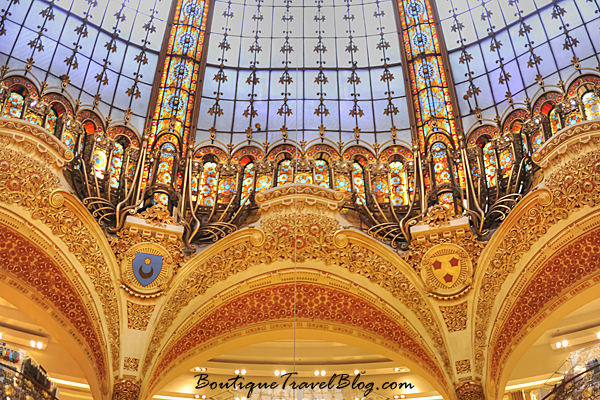 Galeries Lafayette can now also be found in Berlin, Casablanca, Dubai, Jakarta and New York. What a stunning dome and great photos too. I had no idea this existed – will add to my ‘must see in Paris’ list! Oh you must go Suzanne! You’ll love it. Just don’t get too distracted by all the wonderful things to buy! 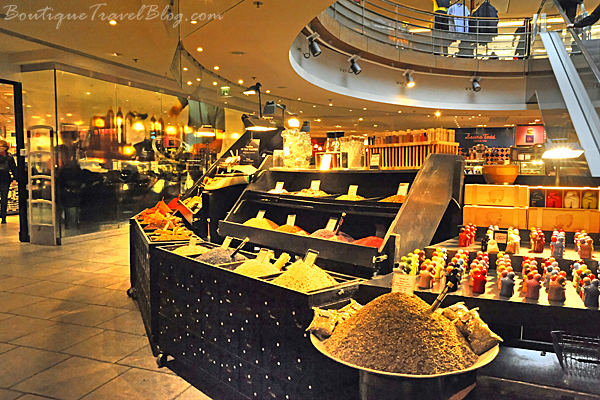 The gourmet section is always one of my stops when I’m in Paris. I think it will be one of mine too from now on!